The case method is a unique method that engages students in an active discussion about issues and problems inherited in practical application. It can highlight fundamental dilemmas or critical issues and provide a perspective on emerging or critical business issues. Case studies focus on problematic or strategic aspects of a real-life scenario to examine how one would solve business problems. It also provides an opportunity to highlight the way of success in business. Interestingly, the presence of business case studies in academia is increasing. Practically, a business case is intended to persuade key decision-makers of the merits of a particular course of action. It also provides an opportunity for students to apply what they learn in the classroom to real-life experiences - an effective way of both disseminating and integrating knowledge. The education system of the developing world has started to give importance to case studies, as they are proved to be more effective than the traditional education system. Accordingly, Bangladesh education system has also observed some changes in its curriculum. Both at the secondary and tertiary levels, changes need to be adopted to have a positive impact on the educational system. Yet, how Bangladesh can contribute to academic development both locally and internationally? The positive news is that Bangladesh is making a positive impact in international academia by publishing case studies in international journals. 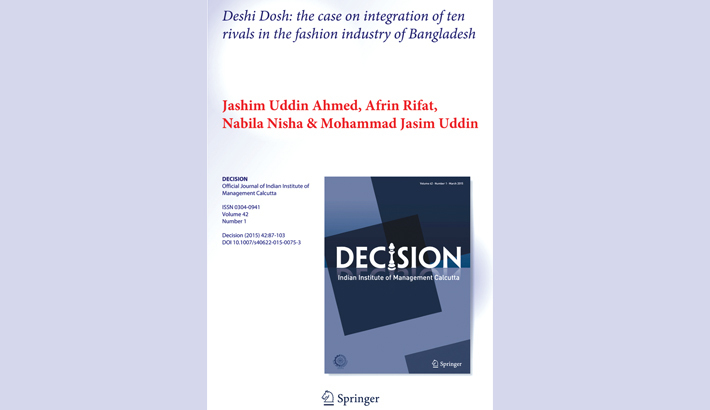 Particularly, Dr. Jashim Uddin Ahmed has been publishing case studies in the field of business and management. As an expert on Asian and Emerging Markets business case writing, he has published over 50 cases and covered all across sectors from topics ranging from A to Z: Agent Banking to Zinda Park. His case studies published in globally reputed journals including Vision - The Journal of Business Perspective (Sage Publications), South Asian Journal of Business and Management Cases (Sage Publications), Society and Business Review (Emerald), Global Business Review (Sage Publications), Decision (Springer), Business Perspectives and Research (Sage Publications), SAGE Business Cases (Sage Publications), FIIB Business Review (Sage Publications), Journal of Strategic Contracting and Negotiation (Sage Publications), Journal of Developing Societies (Sage Publications), Journal of Global Entrepreneurship Research (Springer), and Asian Case Research Journal (World Scientific /National University of Singapore). Let’s look at some of his case articles. Ahmed et al. (2016) conducted a management case on Zinda Park in 2016, which is an eco-park complex in Bangladesh. As the natural areas have been diminishing in the urban areas of Bangladesh, such rural community eco-park has created a positive impact. The park was built for social welfare and contributed to the environment through the development of a natural park. Although Bangladesh’s public sector was putting effort to acquire this park in the name of development, it has failed to do so due to pressures from different stakeholders including its management and environment protectionists. Ahmed &Tinne (2017) illustrated on successes and threats of a non-governmental organisation (NGO) based on ASA - a Non-Government Organisation. There is another case about printing service companies, e.g., Azad Products. The Azad case included diverse products of printing companies, strategic plan for sustainable growth. It also outlined different challenges of printing services. Dr. Jashim also researched social innovation. For instance, BRAC’s floating schools took a great initiative to overcome challenges in basic education. This education model is serving underprivileged children. It is also making progress in socio-economic changes. Studies on such innovation will not only increase the visibility of Bangladesh in the international audience but also improve regional development. In 2017, a case was published on Ferdous Tailors that makes fashionable garments. This case identified the challenges in the tailoring sector. Studies were also conducted in the furniture sector like OTOBI in 2013 – that mainly exports home furniture. Although global depression, state relationships, and different business landscapes are posing challenges to the furniture sector, OTOBI has been progressing through innovation. Furthermore, the author encapsulated the Telecom industry and considered a merger case on Robi-Airtel. The case demonstrated that higher market share and profitability could be earned through a successful merger. An exploratory case study was conducted on RFL Plastics in 2016. The study demonstrated how sales could be driven through the disintermediation approach. The overwhelming experience in understanding how animation firms operating in Bangladesh was studied in 2015 through Ogniroth Studios – which has successfully managed to offer outstanding works within a very short time. Their founders believe in promoting innovation. The case study on floating hospitals in 2015 like Jibon Tari has been serving distress humanity. Impact Foundation has initiated such activity in an era where private hospitals are costly, and the qualities of public hospitals are questionable. There were also other studies on floated schools for residents of wetlands, integration of rivals in Bangladesh fashion industry, dynamic toilet soap market of Bangladesh, the journey of fast technology, social innovation, innovation in the power sector, Islamic Shari’ah banking, dairy products, and agent banking business. Professor Dr. Jashim Uddin Ahmed currently is the chairman of Department of Management & Acting Dean of School of Business & Economics of North South University. His intellectual endeavour in case studies benefits both academia and local communities. Local and international students can learn from these cases – enhancing the quality of learning. Simultaneously, these case studies offer perspectives for policy makers and increase business awareness. Illustration of case studies would enhance the critical thinking of students at the tertiary level of education.